Ladbrokes The Grid - Get your card today with our sign up bonus too! How to get started and claim a superb sign up bonus! The Grid is the Ladbrokes reward card that integrates in-shop and online betting. Once you’ve got your FREE card, you’ll be eligible for all sorts of benefits either in Ladbrokes, or at one of their partners. These benefits are explained further down. 2. Use the current Ladbrokes promo code to claim the free bet. This is revealed above to ensure you can claim their current deal! 5. Check the address is the correct one as this is where your loyalty card will be sent. Click “ORDER NOW” to confirm, and that’s it! You’ll have the funds from the sign up bonus to use online and the Grid loyalty card will be posted out to you in a few days. 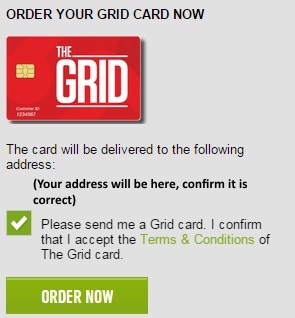 By joining using this process, you’ll also automatically link your online Ladbrokes account to The Grid card. This means you’ll be able to make deposits and withdrawals for your online account in any Ladbrokes shop. So you can deposit in shop and play online, or play online and withdraw in the shops! One further additional benefit of using this method for registration is it automatically verifies your account so you can use it without restriction when betting on the betting terminals. Following recent legislation non-verified users of the FOBTs (fixed-odds betting terminals) are restricted to a maximum bet of £50. This is specifically designed to prevent problem gambling, if you are concerned this is something that may be affecting you please take a look at the gambling help sites linked at the bottom of this page. To be eligible for these rewards you simply have to continue to use your reward card. At the moment you are required to use it at least 4 times a month, so just once a week and you’re in for all the superb offers. But that’s not all! In addition to the partner benefits above, you’ll also receive free bets, money back offers and machine bonuses (for use in shop). These will be emailed or texted to you, so ensure you’ve put the right details in when you sign up, you don’t want to miss out! The benefits of The Grid reward program do change from time to time, so if you want to ensure you’re up to speed with the most recent, you can check this out directly on the Ladbrokes The Grid benefits page. And there’s more still! Simply by betting with them, you’ll be eligible for their various prize draws, currently including a trip of a lifetime to Las Vegas or a 42″ TV! There are always new prizes on offer, so be sure to keep an eye out for them all. This reward card is a great example of getting a bit extra back from the bookies. Remember that other bookies also run these sort of loyalty programs, we’ll be reviewing more of them over the coming weeks and adding to this page as new benefits and prize draws are announced. So keep checking back for all the latest news – or alternatively join our mailing list (top right, on the menu) and we’ll email you when there’s anything new worth hearing about.